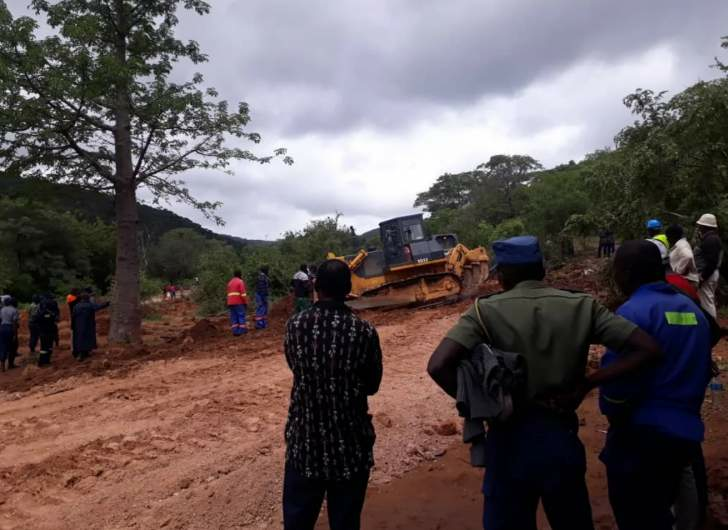 Dozens of police officers deployed for a search and rescue mission in the cyclone- hit Chimanimani were on Tuesday stuck at Rutengeni, several kilometres from the affected areas, as repairs on a damaged part of the road took more than half a day to complete. At the time of writing, dozers and graders were paving a detour to create way for the police and other traffic moving to and from Chipinge and Chimanimani, which are most affected areas. "We have been here since morning. We travel to the affected areas everyday and return to camp at Changadzi," said one of the officers who is part of the pool of cops drawn from various Support Unit troops, and camped at Changadzi, outside Birchenough Bridge. About 98 people have have been confirmed dead and over 217 unaccoubted for after Cyclone Idai hit the eastern part of the country since weekend, leaving a trail of destruction in Chimanimani, Chipinge and Bikita, among other areas. Most people unaccounted for were washed away by the flash floods after torrential rains forced some river banks to burst. Most families are devastated and waiting closure on what happened to their missing relatives. The police officer added: "Today looks like a wasted day because its already noon and the road repairs are yet to be completed." Travellers where stranded at the Rutengeni area where earth movers were busy preparing the detour after a patch became impassable. A queue over vehicles intending to pass stretched several kilometres on each side. Water levels in most rivers had subsided in the partly sunny weather with threats of more rains.